If you have lots of creative work to store, making sure you have the best external hard drive or SSD for your Mac or PC is essential. - Hard drive vs SSD: which is best? Looking for the best external hard drive for your Mac or PC? Look no further. We've dug around the depths of the internet to find you the best external hard drives and the cheapest prices available on each one. Whether you're a film maker looking to store all of your footage or a digital artist fast approaching your laptop's upper memory limits, using our price comparison tool can ensure you get the most affordable prices. As any digital creative knows, getting the best external hard drive is a must for your work. While the average laptop user may need a few extra GB for their holiday photos, creatives in the digital field are filling up hard drives in days with their work. Cloud storage is another option but that takes your work out of your hands, Picking something that's reliably safe and has lots of space, speed and value for money is your best bet. First, let's go over the basics. An external hard drive or SSD (Solid State Drive) is a device that can plug into your machine, giving you an instant boost to storage space, without having to go down the road of pricey computer upgrades. The other major plus is the portability of an SSD, take it with you and plug it into another device for instant file swapping – handy if you swap between PCs and Macs regularly. Right now, our pick for best external hard drive for Mac and PC is the Western Digital My Passport 4TB. It offers the perfect balance of speed, reliability, portability and price. But there are many options out there – scroll down to see our full list of recommendations, and the best external hard drive prices too. There are a number of things to consider when looking for an external hard drive or SSD for your Mac or PC. First, is storage. You'll want to make sure you buy an external storage device that has enough capacity for your needs – without paying for high capacities you'll never use. Around 500GB is a good sweet-spot for external storage, though you can buy smaller capacities, as well as larger ones at 1TB or greater. Hard drive vs SSD: which is best? Another consideration is whether to get an external storage device that uses a traditional hard drive, or one with an SSD. Usually, external hard drives with traditional drives are more affordable and come in larger capacities. There are external SSDs that come with large capacities – but these can be expensive. SSDs are much faster than traditional hard drives, and because they don't have any mechanical or moving parts, they're generally more robust and smaller in physical size as well. So, if you want to store huge amounts of data while keeping prices low, an external hard drive is the way to go. But if speed is your top priority – for example, if you move a lot of large files, or want to run programs off the drive – then choose an SSD. The connection between the external hard drive and your Mac or PC is also important. The first generation rectangular USB-A ports are slowly being superseded by the newer, smaller reversible USB-C ports. These are now found on all modern PCs, and Macs. Some high end PC and Macs, such as the new iMac and MacBook Pro, come with USB-C ports that support Thunderbolt 3. This is the fastest external storage connection there is, and it provides very fast data transfer speeds, though Thunderbolt storage is considerably more expensive than plain old USB. When it comes to the best external hard drives, look no further than the Western Digital My Passport range. This is the latest model to have launched, coming in sizes from 1TB to 4TB. It features cloud storage and 256-AES encryption, along with WD's own backup software. It also offers top data transfer speeds. 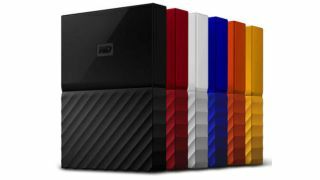 And while it doesn't quite offer a similar speed to solid state drive devices, the Western Digital My Passport range hits a brilliant balance between high storage capacities and quick file transfers without knocking the price way up. The Samsung T5 SSD is a great performing storage device, reaching speeds up to 550 MB/sec, making the most of the USB 3.1 specification. It plugs directly into PCs and Macs with either a newer USB-C port or USB-A, is roughly the size of a matchbox and being a flash storage device, contains no moving parts, so can survive being dropped. External SSDs may cost considerably more than hard disks, but the extra money and faster speeds go a long way. You’ll be able to easily load edit and save 4K video directly on the T5, which can be very slow with a USB hard disk, you can install applications onto it, or even run an entire alternative operating system off it at full speed, if you’re so inclined. G-Technology has long been a favourite of Mac creative professionals, and no small part of this is the clever use of silver aluminium that perfectly matches Apple’s iMac casing, keeping desktop areas with a uniform appearance. The latest incarnation of its G-RAID dual hard disk Thunderbolt product isn’t just a start performer, capable of 440 MB/sec transfer rates in RAID 0, which is pretty incredible for hard disks, but it also gives you a few extras. There's an HDMI 2.2 port on the back, which routes a video signal for an external display over the G-RAID’s Thunderbolt 3 cable, which has plenty of bandwidth to spare even with the hard disk going at full speed. It also has a USB-C port to connect to Macs or PCs that lack Thunderbolt. Expect to pay a small fortune for the largest capacities, but thanks to the easy drive removal system, you could always buy a cheaper, lower capacity G-RAID and upgrade it with off-the-shelf hard disks yourself. If you want to make use of your Thunderbolt port, then this Buffalo MiniStation Thunderbolt is a great option, as it provides twice the speeds of standard USB 3.0 drives. It's also not especially expensive compared to other Thunderbolt drives. This is mainly down to the fact that it's a traditional hard drive, not an SSD, which means it's not quite as fast as it could be – though it will still give you an upgrade to your transfer speeds. Helpfully, the Buffalo MiniStation Thunderbolt also comes with a USB 3.0 port for connecting to computers that don't have a Thunderbolt port. The LaCie Porsche Design is one of the best external hard drives for Macs on sale today, and comes with both USB Type-C to Type-A and USB Type-C to Type-C connectors, making it a versatile way to expand the storage space of your Mac, regardless of what ports it has. This is also one of the most stylishly-designed external hard drives on this list, and it comes with a large 4TB capacity (with other sizes available as well), and it performs brilliantly. The Adata SD700 will suit those looking for a rugged storage device that can provide ample capacity without costing too much. It performs superbly well and remains the only SSD we’ve seen that's IP68 rated. Thanks to the solid state drive that resides in this external hard drive, it's a lot faster than external drives that use traditional spinning hard drives – so you're getting great transfer speeds as well as rugged protection. It also comes in capacities up to 1TB, so you don't have to worry about missing out on storage space just because it uses an SSD. This Adata drive really does hit all the right notes. If you're looking for the absolute largest capacity external USB hard drive, then the WD My Book Duo Is the one to get, as it now goes all the way to 20TB. If you don't mind sacrificing some of the ample storage space you can set the drives up in a RAID 1 array, so you have file backups of your files should one of the drives die. This is an excellent feature if you're going to use this device to back up irreplaceable data, such as your creative work, as it adds a level of protection in case things go wrong. It provides two additional USB ports on the rear, so you can easily insert flash sticks. The device, which comes with two-year warranty, has 256-bit AES hardware encryption, and automatic backup software (WD SmartWare Pro). It's also worth noting that the enclosure used is fully serviceable and that WD ships the drive already pre-formatted for Windows users (NTFS), so you'll want to reformat it to work with your Mac. Lacie’s rugged hard disk series is instantly recognisable from its orange casing, which is a rubber enclosure that keeps the disk safe from even medium-height drops up to 1.2m, along with your precious data. According to Lacie it can apparently withstand the pressure of a one-ton car, and is resistant to rain. That makes it a great choice for content creation when you’re out and about, whether you’re participating in daredevil sports, travelling the world, just a bit paranoid or simply clumsy.